I finally bought a pair of the Chaco’s Z/1 Vibram Unaweep sandals. These were the first pair of Chaco’s I have ever owned. I only tried on a pair a few weeks ago, so I would know what size to order. I am very excited to have these. I have been eyeballing them for the past year or so, and finally have a pair of my own! The straps are not too tight across the foot, however, the tightness can be adjusted to your liken by pulling on the straps and cinching down the buckle. All together, it is a pretty impressive set-up. I never knew that sandals could be so technical. These are. Even the Vibram sole is impressive, with its deep lugs and its grippy outer sole. I am impressed with them, and as well, once I have worn them for a while, I will write-up a more detailed review of them. Update: I have worn the Chaco’s for about a week now. I have worn them while doing stuff around the house, while at my son’s baseball practices and ball games, and even walking in them on a treadmill. I have gotten much more used to the Straps and they actually do not bother the tops of my feet any longer. One problem I am still having with them is getting used to the foot beds. The rubber foot bed is a rubber material, and has a grid-design. These raised squares are what is so rough on my bare feet, but I imagine that after a while my feet will roughen up and it will be no problem at all. One other issue I came across today was while walking on the treadmill today. I had the treadmill’s incline set as high as it would go and going on about 3.2 mph. At about 1.5 miles into the walk I felt what felt like a hot spot forming on the front inside of my heel (near the arch, but still on the heel). Other than this, I am really enjoying the Chaco’s. I am going on a 3-day hike over Memorial Day weekend and am considering taking these for a spin. I have never hiked in sandals, so I may bring my boots as back up. (I just don’t like the idea of carrying the extra weight!) So, anyway, I will be sure to give an update when I return. Update: I wore the Chaco’s today on a 5 mile day hike in Tishomingo State Park. The terrain consisted of rocks, mud and pine needles, as well as some hiking on paved roads and wooden bridges. There was about 1,260 feet of elevation gain throughout the hike. I did not wear socks with the sandals, also I wore shorts rather than long pants. 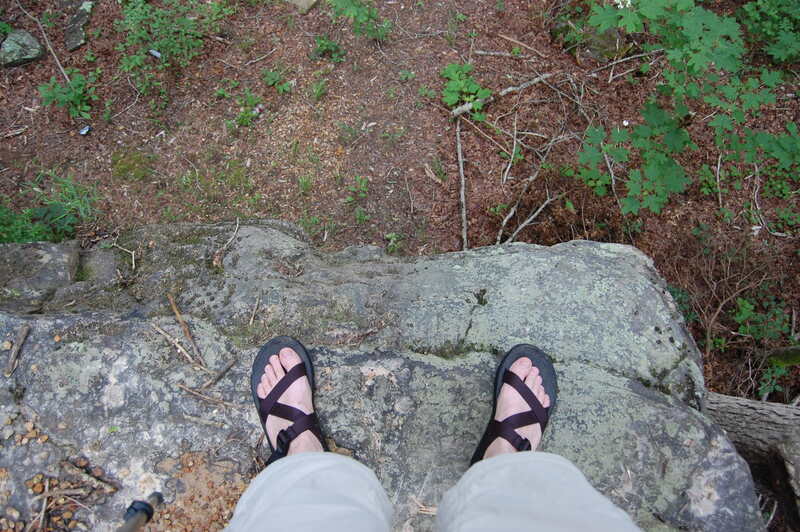 Wearing the Chaco's on the edge of a 20 ft drop off at Tishomingo SP. I started out fine in the sandals but after about 3 miles I could tell that I was wearing them. The foot beds are rough on my tender little feet, but I am getting them toughened up wearing them. The foot bed is made of a hard rubber material, and has tiny little squares like a grid. These little squares kind of eat at my foot while walking. It seemed worse on the outer tight heel and the ball of my left foot, but of course the bottoms of both of my feet felt completely tender. As for traction, the Chaco’s don’t have it on these wet rocks. Some of the rocks are moss-covered, but they all are wet. I had to really watch my footing while on these rocks, as I found out at the beginning of my hike. I almost busted my tail as I stepped on a large rock to cross over, but I quickly managed to catch my balance and keep from falling. After this I was really careful on the rocks, as well as the muddy areas, especially going down hill. So, now I am at home and my feet are resting from the sandals. I have put them on a few times to walk to the mailbox, and while I can still tell they are tender, they are not too tender to keep me from wearing them. So, yes my feet hurt, but that is to be expected. The real test is to see if they will eventually stop hurting. So, I don’t plan on taking these as my primary footwear on a long hike, I will continue to use them on day hikes to see how they come along. So, when the time comes I will be sure to update this page. chacos ruined the insole / footbed with this grid pattern. The old footbed was great, but this larger grid makes everyone’s that I have asked, have sore feet on the bottom. So much so that they can’t be worn for much walking at all. 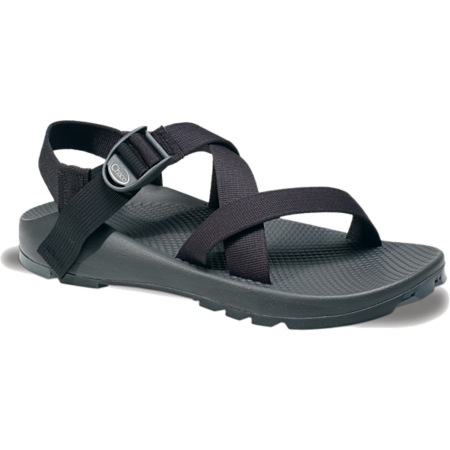 Chacos, pleaassee go back to the old footbed with the less aggressive arch and gentler footbed. I bought my first pair of Chacos in ’07 and loved them at first, because they looked fantastic; from a womans perspective this matters! However, after wearing them out over and over to break them in, I just could not find the right fit. I read an article in an AT book the other day that mentioned Chacos and said the biggest drawback was the high arch in the shoe, which is horrible if you have low/no arch. Thats it! That is why I have a hard time keeping them on my feet; my arch is low. So for now I just wear them on short spurts to outings when I want to look earthy and fabulous. I wish my feet could get along with them, because I love them, but they will not be accompanying me on my hike.